Samsung is currently marketing the Galaxy Tab 2 (10.1) together with the Galaxy Tab 2 (7.0) - the improved versions of both variants. 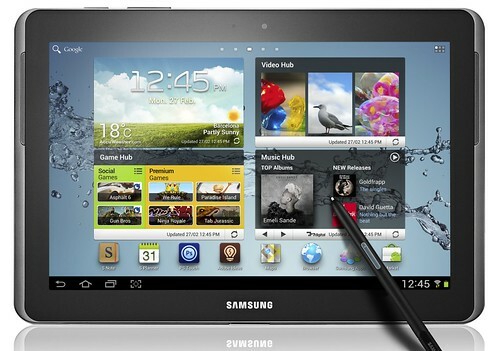 The Galaxy Note 10.1 is basically designed based on Samsung's Galaxy Tab 2 (10.1) but comes with S-Pen. It allows users to draw, annotate and write notes on the 10.1in screen. It has faster 1.4GHz processor, more RAM and better camera. Other than that they are practically the same slabs. 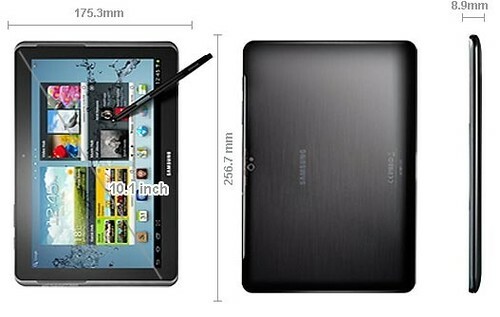 Samsung Galaxy Note 10.1 - Image: techworld. All specifications obtained from Techwold. This 10.1" slab is said to be an attempt to match the iPad. Let's see how it fares, considering it has gone back to the drawing board for 6 months since its first announcement in February 2012. Perhaps an interesting option (or rather more confusion to existing Galaxy Tab users), but I'm sticking to my snappy iPad 3 for now. Happy user.